1) Pre heat oven to 450 degrees. 2) Spray cookie sheet lightly with oil spray. 3) Place pizza shell on cookie sheet and spoon pizza sauce into the center and spread evenly. 4) Sprinkle Naked Nuggets and mushrooms evenly on top of sauce and cheese on top. 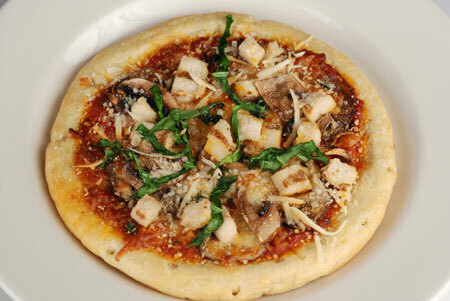 5) Place pizza in the oven for approximately 10 minutes or until the top begins to brown. 6) Remove from oven and cut into four pieces. 7) Sprinkle with fresh basil. Serve.